Today we travel down the Via Ostiense, to the tomb of the great Apostle to the Gentiles, St. Paul. The story of his conversion and travels of evangelization recorded in Sacred Scripture (see Acts 8-28), tradition holds that he was killed during the Neronian persecutions, in 64 or 67. His status as a Roman citizen meant that he merited a more dignified manner of death than the cross or the arena, and so at the end of his life he too once traveled this road, to a place now marked by the monastery of Tre Fontane. Beheaded, his body was interred in a tomb along this busy road between Rome and the port at Ostia. There it was quietly honored for many years, until Constantine began his building program on behalf of the recently legalized Church. This first church of St. Paul’s was complete by 340 at the latest, although the nearness of the tomb to the road dictated that the church above it be rather small. The popularity of the Apostle soon drew large crowds to visit the site, making apparent the need for a larger church. The emperors Valentian II, Theodosius I, and Arcadius finally took the initiative to provide for a more fitting edifice and building began around 385. When it was dedicated around 400, in the reign of the emperor Honorius, it was the largest and most architecturally advanced basilica in Rome; its builders had learned from experience with the older churches at the Lateran and Vatican how to build a structure that would best serve both as a shrine and a center of worship. The embellishment of the basilica soon began, including the still remaining, though heavily restored, mosaic on the triumphal arch. Other than some damage sustained after a lightning strike or earthquake in 442 or 443, the basilica fared well for the next several centuries. However, its reputation as a place of exceptional beauty did not serve this church in the end, as it attracted the Saracens, who sacked the complex in 847. Restoration soon commenced, with a defensive wall being constructed and the church and surrounding buildings being known as Joannopolis, after Pope John VIII who ordered the defenses. The mid-eleventh century found a reforming abbot in charge of the Benedictine monastery here. Named Hildebrand, he would be elected to the See of Peter in 1073, and as Pope St. Gregory VII would bring the spirit of renewal that he had brought here to the Church universal. The increasing fortunes of Rome in the later Middle Ages were felt here as well. Beginning in the early thirteenth century, Popes Innocent III and Honorius II began a new round of restorations and renovations, even writing to the Doge in Venice to request that he send mosaicists to help guide the decoration of the apse. The high altar was adorned with a new ciborium by Arnolfo di Cambio in 1285. Yet these fortunes did not last and by 1425 the building was near ruin, being saved through the energetic efforts of the future Pope Eugene IV, who also undertook a reform of the attached monastery. Unfortunately, disaster was to come four centuries later, when, on the evening of 15 July 1823, workers accidentally set the roof on fire. By the time it was extinguished, fire destroyed or heavily damaged the entire nave, from the façade up to the triumphal arch. Pope Pius VII, who was but a few days from death at the time, was never told. Having been elected under difficult circumstances in Venice in the midst of the Napoleonic Wars, imprisoned by the French emperor, and then faced with the task of rebuilding the Church in Europe after the wars, his advisors considered him to have faced enough sorrow in his life. Although a plan which would have only rebuilt the transept and apse was briefly considered, it was soon decided to not only restore the damaged sections, but also to rebuild the nave in the style and according to the dimensions of the early basilica. The task was an ambitious one, and so Pope Leo XII sent out a worldwide appeal to aid the rebuilding. The project became an international and inter confessional affair. Malachite and lapis lazuli were sent from the Russian Tsar for the lateral transept altars, alabaster was given from Egypt for the windows and columns, and the facade itself was executed by the Italian government. In 1840, the consecration of the restored transept took place, with the nave being finished in 1854. Unlike the previous basilica, which used older columns from various sources, the new nave was constructed with completely new material, giving it a uniformity the old one never had. The quadriporticus in front of the basilica was finished in 1928, completing the rebuilding. This quadriporticus, or courtyard, is the first thing you see as you make your way inside the basilica. A large statue of St. Paul stands in the center, the apostle clutching the instrument of his martyrdom. Continuing inside, you immediately find yourself in the vast nave, with two aisles on either side, all confidently marching up to the transept. 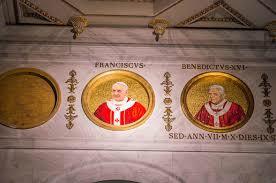 In the nave is a series of mosaic portraits of the popes that line the clearstory. Beginning with St. Peter they come around the entire church, weaving back and forth, until ending in the right side aisle Below each portrait is the name of the pope and the length of their reign. Coming to the sanctuary you find the surviving parts of the old basilica. A large paschal candlestick, likely a work of the early 12th century, stands at the front of the sanctuary, near monumental statue so the two great patrons of Rome - Peter and Paul. In front of the high altar is the confessio - going down you find yourself in front of the tomb of the apostle. A marble plaque, dating from the 5th century, was found here with the inscription "Paulo Apostolo Mart." supporting the tradition that Paul is buried here. Above the tomb is a reliquary holding the chains that bound St. Paul while in Rome. In the floor are glass panels that allow you to see the apsidal foundation of the Constantinian shrine to Paul. In the center of the apse is a beautiful mosaic, its style hinting at the Venetial influence of its creation. 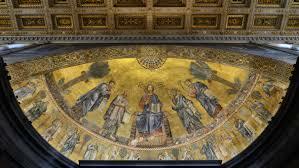 Christ sits in majesty in the center, flanked by Sts. Paul and Luke on His right, Sts. Peter and Andrew on his left. Beneath are the other apostles, along with Sts. Barnabas and Mark, all holding scrolls on which are written the phrases from the Gloria (sung at Mass). On the arch above are the Blessed Virgin on the left, St. John the Baptist on the right, and the symbols of Sts. Matthew and John.